Jimmie Johnson ran a strong race in his No. 48 Hendrick Motorsprots Chevrolet SS Sunday, but the six-time champ struggled all night with a car which he said was “really, really loose” and would sometimes “bug out” when racing around other cars. 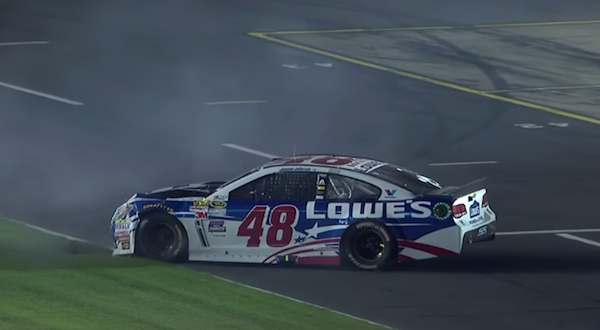 With just over 125 laps left to go in the Coca-Cola 600, Johnson’s buggy car got the better of him. The Hendrick Motorsports driver was running in the top 10 when he lost control of his car in Turn 4. Johnson appeared to have saved himself from any major wreck by directing himself down pit lane, but the car then slid sideways and clipped the inside pit wall, pushing in the Chevy’s nose and damaging the hood. The wreck was Johnson’s second of the night, with the first coming when the No. 48 car again lost grip on Turn 4 and spun. When the race restarted on Lap 279 following his second spin, Johnson was second last in the grid and in the garage as his car underwent repairs.